The TWA Hotel at JFK Airport in New York will feature an exhibit of historic items as part of its opening May 15. Exhibits will feature rare crew uniforms, personal memorabilia and even vintage furniture from the TWA Hotel’s collection of 2,000 items. Former TWA employees and their families donated many personal items, including photos, letters and even an autograph given to a flight attendant by passenger Kirk Douglas. 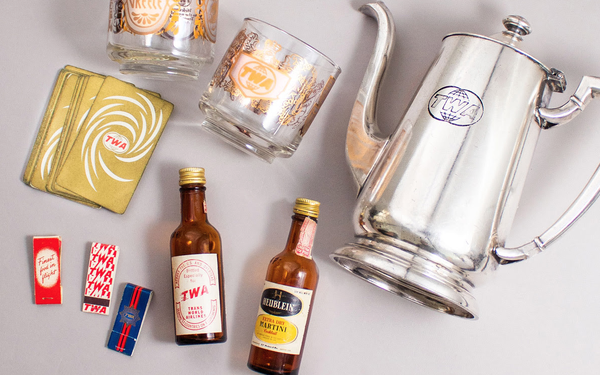 Graphic matchbooks, gilded playing cards, custom tableware and an (extra dry) martini-in-a-bottle represent just a few of TWA’s in-flight offerings. Located within the former TWA terminal — a historic landmark designed by Finnish architect Eero Saarinen and opened in 1962 — the exhibit will allow visitors to experience the jet age through authentic artifacts, interactive displays and personal narratives. Over the last two years, MCR/Morse Development has restored Saarinen’s masterpiece, dark since 2001. Two new buildings behind the terminal house the hotel’s 512 guestrooms. MCR/Morse hired an archivist to catalog each item and partnered with the New York Historical Society to develop the exhibitions. The team’s research has taken them from Kansas City — home of the TWA Museum — to Yale University’s Saarinen archives to the Port Authority of New York and New Jersey, which donated original blueprints of the TWA terminal. Evolving exhibitions will initially focus on two major themes: Trans World Airlines’ history — including eccentric billionaire Howard Hughes’ tenure as the airline’s owner — and Saarinen’s development of the terminal at JFK. Future exhibits will delve into the dawn of the jet age in New York City, as well as the mid-century modern design movement. Crafting the exhibits was a priority from the start of the TWA Hotel project, says Tyler Morse, CEO and managing partner of MCR and Morse Development. The hotel will feature six restaurants, a coffee bar, high-end retail outlets, event space, a rooftop bar and observation deck, and what it claims is the world’s biggest hotel gym, a 10,000-square-food center. A Lockheed Constellation “Connie” L-1649A plane has been transformed into a cocktail lounge.